No recent Dining Dish Newsletters. No posts to the blogs. 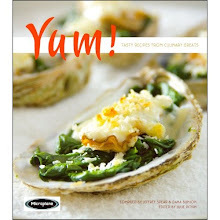 I swear I am alive and well and living (that is questionable) in my office working on a cookbook. The time frame on the book is very tight, so tight I haven't even made it to the gym. I continue to represent and promote Sotto Sopra Restaurant . Also on the table, pun intended, is planning the marketing and public relations on the opening of Pazza Luna Restaurant in February. Dining Dish has to eat so the paying jobs have come first. I was in New York in September for the Star Chefs Conference. November had me in Atlanta for the Women Chefs and Restaurateurs Conference. December I was back in New York for lunch and restaurant look-sees. I have a ton of material to write about. Don't give up on me. I promise to be back and delectably informative. Good news, bad news. I receive a fabulous digital camera for the holidays. More personalized photos to follow. So between recipe testing, recipe editing and promoting a new restaurant not much time for anything else. To those who understand the title of this article, right now I wish I was Jacques Brel for I would be in Paris.